Adjunct Assistant Professor, July 2009 – present, Department of Process Engineering and Applied Science, Dalhousie University, Halifax, NS. 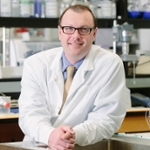 Dr. Michael Nickerson holds a Saskatchewan Agriculture and Food Research Chair in Protein Quality and Utilization in the Department of Food and Bioproduct Sciences at the University of Saskatchewan since 2006. His main research areas include evaluating processing technologies for proteins derived from agriculture commodities, assessing protein quality, improving plant protein functionality, and developing value-added innovations associated with the use of proteins derived from oilseed, legume and cereal crops. Currently, he is Editor-in-Chief of Canadian Food Insights (www.canadianfoodinsights.com), is President of the Canadian Institute of Food Science and Technology (www.cifst.ca; 2016/17), serves as a Board of Director for the Agricultural Council of Saskatchewan (www.agcouncil.ca) and a member of the Editorial Board of Food Research International. Stone, A.K., Teymurova, A., Chang, C., Cheung, L. and Nickerson, M.T. (2015). Formation and functionality of canola protein isolate with both high -and low-methoxyl pectin under associative conditions. Food Science and Biotechnology. 24, 1209-1218. Stone, A.K., Karalash, A., Tyler, R.T., Warkentin, T.D., and Nickerson, M.T. (2015). Functional attributes of pea protein isolates prepared using different extraction methods and cultivars. Food Research International, 76, 31—38.